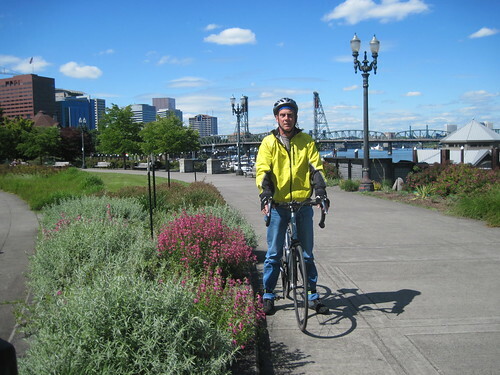 biking in Portland, a photo by Southworth Sailor on Flickr. Wednesday was my birthday. Esther and I both took personal days and we took a little trip to Portland. It was the only dry day of the week. We brought our bikes along in case a certain car hunting expedition failed (which it did). The city was in preparation for this weekend's Rose Festival. We enjoyed biking along the river, exploring the Rose Garden and a little shopping.